dunkdaft: A.R.Rahman wins Two Oscars !! And India wins Three !! A.R.Rahman wins Two Oscars !! And India wins Three !! Hurray...Three cheers for A.R.Rahman for winning not one but two Oscars. This is very glorious moment indeed. Just imagine, How does Rahman himself must be feeling? One of the most memorable moment of his life. Congratulations to him !! Love You !! For everything, for making India proud !! A R Rahman scripted history by becoming the first Indian to win two Oscars for the Best Original Score "Slumdog Millionaire" and its foot-tapping song "Jai Ho". "There is a Hindi dialogue 'mere pass ma hai' which means even if I have got nothing I have my mother here. I want to thank her for coming all the way to support me," the 43-year-old musician said. "The essence of the film is about optimism and home. The power of hope in our lives. All my life I had the choice between hate and love. I choose love and here I am," said the musician while accepting the award for best song, penned by Gulzar. Okay, though awards does not matter much as the fuss is all around them always. But its the recognition of your work, and that too when you are giving your best after best each and every time. And at an International platform, the biggest one - Oscars. That does matter, and this goes to all work which Rahman did in past. I would like to put some links related to Rahman for those who still do not know much about Rahman. So it will be much of use to them. And how can I miss to put up the video itself which drove crores of fans?? Here is the video 'Jai Ho'. Sung by Sukhwinder Singh, Tanvi Shah, Mahalakshmi Iyer & A R Rahman. With Superb lyrics by veteran lyricist Gulzar. 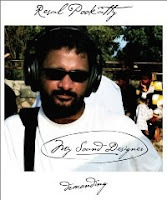 Also a worth mention to Resul Pookutty - Best Sound Design for Slumdog.. A well deserved for a guy, who has worked upon some great projects like Saawariya, Ghajini, Gandhi-My Father and many Hindi films. Here is pic from Ghajini's publicity pictures. Here below, are links to Everything about Rahman. I know...I'm so happy too!!! Oh it's nice to see Rahman with two of them! I think he'll be back often, now that he'll be working more on Hollywood projects. As for Hindi films, I'm starting to think we'd be lucky to see one win in our lifetime, for what it's worth. A second to Bhargav's comment on the template. I was thinking about the criticism of the soundtrack to SM. I don't think it's mediocre at all. Jai Ho is actually quite powerful. And I try not to let a soundtrack bother me much outside of the context of the film (unless it's really bad or stolen, e.g. Pritam, LOL). Bhargav: Yeah, Indian Language Film, that too, I want in Mainstream category rather than in 'Foreign Film category. Sita-Ji: Hummm...He 'was ' cute. Jazz: Seems like you have contradictory views. Its nice to know that someone 'did not' liked music !! Thanks, Bhargav and tBF. Actual credit goes to B Themes who has designed this. Delhi 6 - A Kaleidoscope with a single mirror !! Billu - Not Good, Not bad !! Ruins & Fossils - Dholavira, Kutchh. Sand, Salt & Sky - Dholavira, Kutchh.